Students Amy Gallagher and Claire Beattie soak up the sun at Portrstewart Strand Beach. PICTURE MARK JAMIESON. A busy warm day with cars at Portstewart Strand Beach. PICTURE MARK JAMIESON. Niamh Cooper from Belfast shows her running skills on a sunny day at Portstewart Strand Beach. PICTURE MARK JAMIESON. Press Eye - Weather Pictures - 7th May 2017 Photograph By Declan Roughan Tom Clarke from Wexford enjoys the sunshine in Botanic Gardens. Press Eye - Weather Pictures - 7th May 2017 Photograph By Declan Roughan William Crawshaw and Becky Holdich from Leeds visiting Belfast for the weekend enjoy the sunshine in Botanic Gardens. 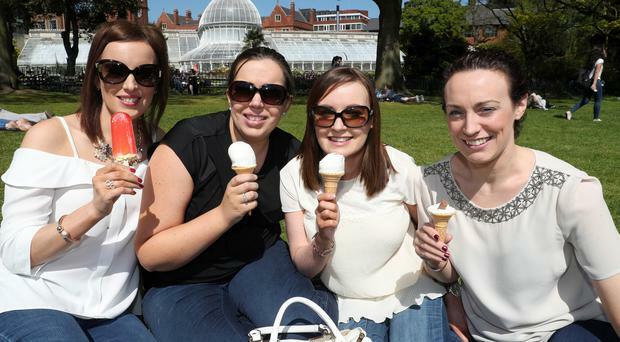 Press Eye - Weather Pictures - 7th May 2017 Photograph By Declan Roughan (L-R) Sarah McGarry from Belfast and Catherine laverty from Birmingham enjoy the sunshine in Botanic Gardens. Press Eye - Weather Pictures - 7th May 2017 Photograph By Declan Roughan Sunshine in Botanic Gardens. Press Eye - Weather Pictures - 7th May 2017 Photograph By Declan Roughan Clare Miller, Sion Mills, Emma Arkinson, Killyclougher Roisin Campbell, Dungannon and Cathy O'Neill Dungannon, enjoy the sunshine in Botanic Gardens. 5 May 2017 - Picture by Darren Kidd / Press Eye. The glorious May weather continues today (Fri 5th May) as the gates open to Northern IrelandÕs premier gardening event - Allianz Garden Show Ireland at Antrim Castle Gardens. Promising a fabulous Festival of Flowers, Food and Fun, the three day Show is set to welcome a bumper crowd to the stunning Antrim setting over the weekend. Enjoying the sunshine is Alice Smyth from Ballymena. The Allianz Garden Show Ireland will run from 5th - 7th May at Antrim Castle Gardens and is open daily from 10am-6pm with parking in town centre car parks and at The Junction with a shuttle bus running. Adults tickets cost £10 (concession £8), the event is FREE for children under 16 and there is a reduced rate for online booking. For more information visit www.gardenshowireland.com. 5 May 2017 - Picture by Darren Kidd / Press Eye. The glorious May weather continues today (Fri 5th May) as the gates open to Northern IrelandÕs premier gardening event - Allianz Garden Show Ireland at Antrim Castle Gardens. Promising a fabulous Festival of Flowers, Food and Fun, the three day Show is set to welcome a bumper crowd to the stunning Antrim setting over the weekend. Enjoying the sunshine is Finlay Smyth from Ballymena. The Allianz Garden Show Ireland will run from 5th - 7th May at Antrim Castle Gardens and is open daily from 10am-6pm with parking in town centre car parks and at The Junction with a shuttle bus running. Adults tickets cost £10 (concession £8), the event is FREE for children under 16 and there is a reduced rate for online booking. For more information visit www.gardenshowireland.com. 5 May 2017 - Picture by Darren Kidd / Press Eye. The glorious May weather continues today (Fri 5th May) as the gates open to Northern Ireland’s premier gardening event - Allianz Garden Show Ireland at Antrim Castle Gardens. Promising a fabulous Festival of Flowers, Food and Fun, the three day Show is set to welcome a bumper crowd to the stunning Antrim setting over the weekend. Enjoying the sunshine are P5s Philip and James with Mr Thompson from Kilbroney IPS. The Allianz Garden Show Ireland will run from 5th - 7th May at Antrim Castle Gardens and is open daily from 10am-6pm with parking in town centre car parks and at The Junction with a shuttle bus running. Adults tickets cost £10 (concession £8), the event is FREE for children under 16 and there is a reduced rate for online booking. For more information visit www.gardenshowireland.com. 5 May 2017 - Picture by Darren Kidd / Press Eye. The glorious May weather continues today (Fri 5th May) as the gates open to Northern Ireland’s premier gardening event - Allianz Garden Show Ireland at Antrim Castle Gardens. Promising a fabulous Festival of Flowers, Food and Fun, the three day Show is set to welcome a bumper crowd to the stunning Antrim setting over the weekend. Enjoying the sunshine is Eden John Robinson from Antrim. The Allianz Garden Show Ireland will run from 5th - 7th May at Antrim Castle Gardens and is open daily from 10am-6pm with parking in town centre car parks and at The Junction with a shuttle bus running. Adults tickets cost £10 (concession £8), the event is FREE for children under 16 and there is a reduced rate for online booking. For more information visit www.gardenshowireland.com. What's the time? Could soon become a bit of a head scratcher in the years to come depending on what side of the border you are on. On Wednesday the European Parliament voted in favour of abolishing summer time - not the general improvement in weather conditions, but rather the twice yearly change of the clocks. The successful vote calls on the European Commission - which has in the past been reluctant to change the system - to assess a change and if necessary do anyway with the system. Currently the clocks 'spring forward and fall back' in order to take advantage of the brighter summer nights. But MEPs argued the time change affected people's health and can lead to an increase in road traffic accidents. During the debate in parliament MEPs heard how there was already three time zones across Europe and any change would need to be "uniform and synchronised" in order to protect the workings of the internal market. Leading the debate Violet Bulc argued the move away from the system could improve energy consumption levels and public health. However, it was also claimed any medical evidence was "inconclusive" as to if there were any health benefits. One MEP claimed the change would just alter the behaviours of people from summer time to the winter - in that lights would be on for longer in the evenings as opposed to the mornings - and have no overall impact. Another MEP said it was a nuisance having to change all the clocks around her house twice a year, so this would be welcomed. On the matter of people becoming sick because of the current change, Margrete Auken dismissed the claim: "Let's campaign to ban all east/west travel in that case. We should all be sick. "I love summer time, those long light evenings... we can work longer, we can sit outside... you can enjoy it. Irish MEP Mairead McGuinness said her constituents were split on the matter. She said some had said it had been tried 40 years ago while farmers welcomed the idea their wives were more concerned about having their children go to the school and return in the dark. "Maybe we should have a referendum on it, but the result could be close and it could be dangerous," she said. Krzysztof Hetman added: "People want this, what are we waiting for?" With the final decision still to be taken, the change, if approved, will come into force after Brexit meaning a decision would be needed in Westminster on if the UK would follow suit.